The Myth of Maturity - Description | W. W. Norton & Company Ltd.
What do young people at the threshold of adulthood really need and want? Why do so many responsible and motivated teenagers become young adults who are still dependent, financially and emotionally, on their parents? Why are many young people today so quick to leave childhood behind, but so slow to become adults? 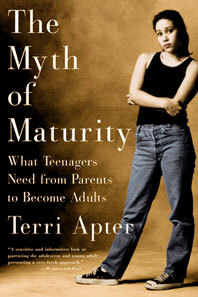 In this wise and compassionate book, Terri Apter debunks outdated and misguided ideas about maturity: Acting in the name of love, many parents withdraw emotional or practical support, thinking it best for a son or daughter to solve his or her own problems—even to suffer alone the consequences of mistakes. Apter shows us that young adults actually need a parent's guidance and support, while also requiring respect and independence. Based on carefully observed case studies and current research, this book describes how we can support young people through a crucial stage in their development. Terri Apter reveals how everyday judgments impact our relationships and how praise, blame and shame shape our sense of self.